This project is for the automation of the grain handling at a facility in Nebraska. There is no traditional HMI with this project. The Ignition application handles the device level control of every motor at the facility. This particular application was on a single server running a MySQL database. There were four clients, one PLC connection to an Allen Bradley ControlLogix, about 12,000 real-time tags, and a few transaction groups logging about 1,500 points of data. The project was developed originally in Ignition version 7.5 and it fully leverages templates and UDTs. Ignition fills the need for both control and data at this facility. As with many grain elevators, operators are able to put a truckload of grain into any bin. Additionally they need to unload grain out of those bins and blend it to be shipped out onto a train. A grain elevator typically has hundreds of pieces of equipment and all of those pieces need to be in the correct state (conveyors are on, gates are open, distributors are set for the correct hole) for the grain to get routed to the destination. 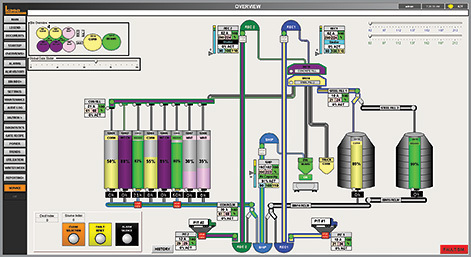 The automation system allows the operator to select a single source and single destination for the grain path and the system turns on all the necessary equipment and puts it into the correct position. Controls are also built in for running the individual pieces of equipment in manual mode for maintenance functions. Not only does it handle all of the controls, it also records a large amount of data that many grain facilities are now finding beneficial. Preventing explosions at a grain elevator is of the utmost importance. Along with all the typical trending done on the amperages of conveyors, Konnection also trended all of the bearing and rub block temperatures for all of the conveyors. 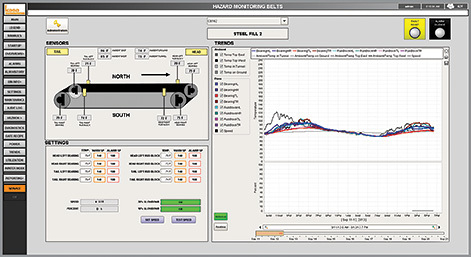 The operators can look at historical data and be proactive about replacing bearings or realigning a belt to prevent problems before they happen. Another key historical piece is the historical mode function Konnection has built in. Konnection takes a snapshot of the entire facility on a minute-by-minute basis. This includes which pieces of equipment were running, the open/close status of all the gates, what hole the distributor was on, which paths were being used, what commodities were being conveyed, how well the equipment was being utilized, what commodities were in the bins, and how full the bins were. The operator can go into historical mode and select any historical time from the list and effectively see the status of the elevator in that moment of time. This is beneficial for several reasons. The first is operator accountability. An operator may have said that he started transferring grain at 2:00 from Bin 1 to Bin 2 but the system shows that he didn’t start doing it until 3:30. Additionally, his manager may have told him to transfer Bin 1 to Bin 5 but he transferred Bin 2 to Bin 5 instead. The system would pick up on this and help identify these errors. The historical mode can also be very helpful after there was a contamination issue in determining the root cause. Finally, the historical mode can also be helpful in the case of a catastrophic event. The historical mode, along with all of the other data logging that is being done, can offer many clues as to what led to the event. The project uses several different indicators to show what is going on with the facility. These indicators include the status of the motor, the commodity being conveyed, and the leg path that is being utilized. When Konnection engineered the project, it may have set up Wheat to be displayed as yellow. However, when Konnection shows the system to the customer, they may want Wheat to be displayed as Brown. Konnection has set up all the templates to get the style information from a database table. Therefore, when the customer wants us to change a color, Konnection can go into the database and change it. That change gets propagated all the way through every screen on the project. This was a very successful project for Konnection. Due to its success, Konnection is currently engineering the automation for this facility’s sister site just a few miles down the road. The new facility is owned by the same company as the original facility. The operator can select a single source and destination for the grain path. The system turns on and correctly positions all of the necessary equipment. 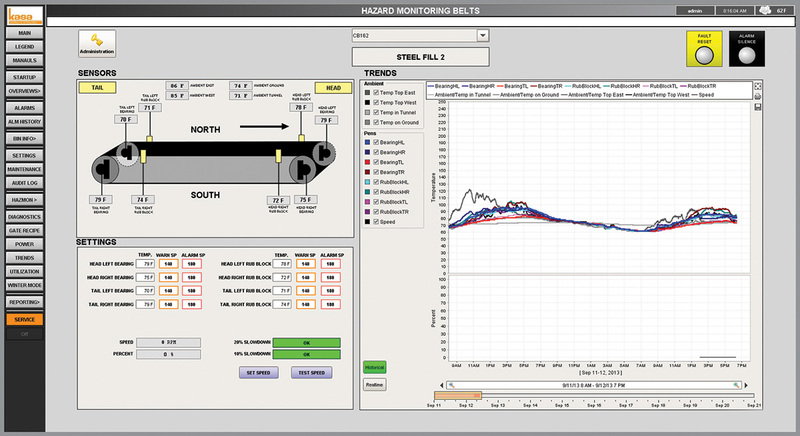 Operators have visibility to both real time and historical data for the hazard monitoring system. This allows them to be proactive about safety and maintenance of the equipment rather than reactive. A snapshot is taken of the entire facility minute by minute, giving the operator a visual status of the elevator in that moment. This aids in operator accountability and troubleshooting when trying to determine the root cause of a problem.